These paper dragons were very inexpensive compared to the dragons I've posted before. 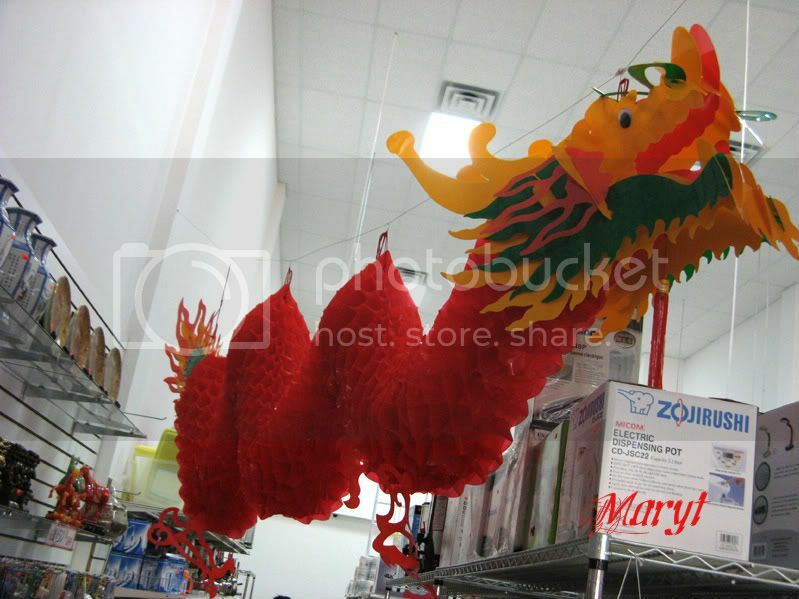 I thought they were beautifully decorative and when I have a party next I may just buy them to hang from my ceilings. Go visit Melli to find others who are participating in this Dragon Hunt. Wow, you have been finding the most interesting dragons! How do you manage to find all these dragons ? I came back yesterday evening but haven't seen a dragon so far, lol ! 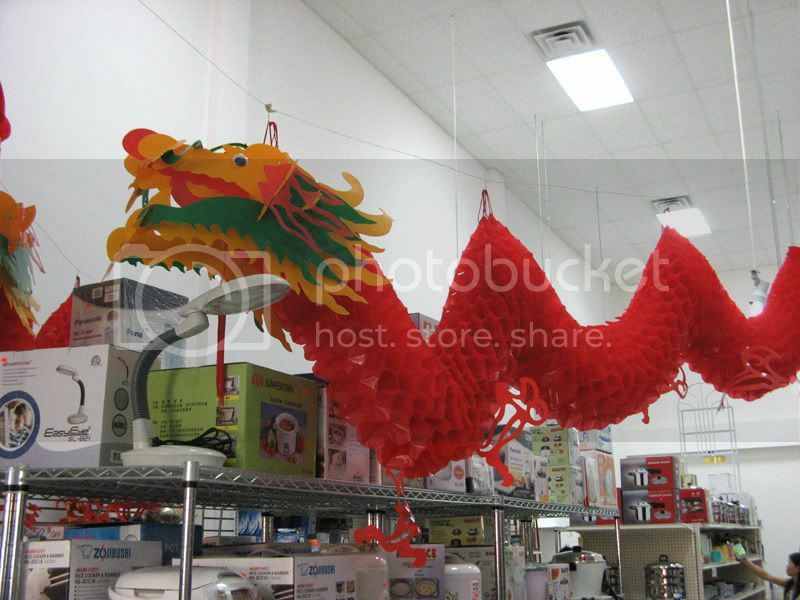 Now that would be fun hanging from the ceiling for a party! Great hunting Mary!! Those paper dragons are great. They are so cheerful looking. There are lots of dragons out there. I'd never know. How smart of Millie to start this hunt! I've been looking back through your blog. You've found some lovely dragons. This one is great - so bright and colourful. Thank you for reminding me how fortunate I am. I'm no millionaire but I could afford a helper to do my household chores and look after my kids. It will take time to change, if the governments of those underdeveloped countries pull up their socks and revive their economies, giving their people jobs and a better life. Many helpers have to leave their families behind to work overseas, they have no choice. With little or no education and no jobs in their countries, they could only grit their teeth and travel far away to make a living. They want to get out of the poverty cycle too. Singaporeans are blessed and despite the high wages and taxes we have to pay for a helper, we can enjoy our family life and excel in our careers... thanks to the overseas workers. I don't know why, but for me, it's VERY difficult to hunt dragons! you find most amazing things! I went looking for one of these in our local party store because if there is a party store in the U.S.A. that just might have them it would be a party store in Hawaii, yes? NOT! There doesn't appear to be a dragon on the leeward side of this Island from Kunia west! I don't see any in my life so I guess I'll not get into this photo hunt! What cool dragons. You are a good dragon hunter. Awwwwwww man! Where'd you FIND those! They are GREAT! I would have 'em for a party too! They really liven the place up! The second Chinese wingless dragon I have seen today and I thought they were rare. I love dragons! Yours is tops Mary...well done. WOW, Mary these are awesome!! Would have been great for Ruby Tuesday too, haha. I can see why you'd want to buy these to hang at a party, they are gorgeous.